Independence Day, commonly known as the Fourth of July or July Fourth, is a federal holiday in the United States commemorating the adoption of the Declaration of Independence on 4, 1776. America celebrates with parades, bar-b-ques, carnivals, fairs, picnics, concerts, baseball games, family reunions, political speeches, ceremonies and most importantly, fireworks. Please remember that loud noises frighten both animals and children. So, keep your pets inside and maybe turn on the TV or radio for background noise to reduce what they hear going on outside. For children, the percussion those fireworks put out are huge and potentially damaging to tiny eardrums. Get the children some noise reduction ear plugs or headsets. They will still love the colors and hear some of the blasts, but they will be protected. Fireworks are meant to be enjoyed, and you'll enjoy them much more knowing your family is safe. Take extra precautions this Fourth of July and your holiday will be a blast! 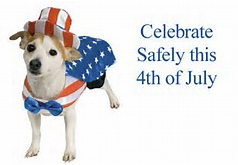 We at Safelyfiled wish you a very safe and secure celebration with family and friends.